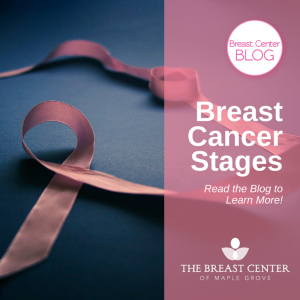 Stage 0 refers to a non-invasive cancer where abnormal cells have not spread outside of the breast ducts or lobules into surrounding healthy breast tissue. This is the earliest stage at which invasive breast cancer can be diagnosed. Stage 1 cancers are categorized as 1A or 1B based on the size of the tumor and whether cancer is present in the lymph nodes. There is a tumor in the breast and there are small groups of cancer cells in the lymph nodes. Stage 2 cancers are categorized as 2A or 2B based on the size of the tumor and whether cancer is present in the lymph nodes. Tumor 2-5cm and has not spread to lymph nodes. Stage 3 cancers are categorized as 3A, 3B or 3C based on the size of the tumor and whether cancer has spread to lymph nodes or surrounding tissue. Stage 3C breast cancer is also categorized as operable or inoperable. There is a tumor of any size (or no tumor at all) and cancer has spread to lymph nodes near the underarm or breastbone. Stage 4 breast cancer, also called metastatic breast cancer, refers to breast cancer that has spread to other areas of the body, which usually includes the bones, lungs, liver or brain. Mammograms save lives by finding breast cancer in the earliest and most treatable stage. When caught early at stage 1, breast cancer can be very effectively treated with 5-year survival rates at about 98%. If you haven’t had your mammogram yet, visit The Breast Center of Maple Grove. No appointment required. Walk-ins are welcome Monday through Friday 7:30am-5:00pm, with late hours on Tuesdays until 8:00pm. If you need a mammogram in Minneapolis, come to the Breast Center of Maple Grove for a comfortable environment, advanced technology, and a schedule that works with your busy life. Most radiologists agree that the average woman should begin receiving annual screening mammograms at age 40. Women at higher risk, or with additional risk factors may need screening mammograms earlier or more often. It’s always best to talk with your doctor to decide what is best for you. You will be asked to undress from the waist up and you’ll be given a warm robe and gown to wear. An experienced and caring female technologist will position your breast between to plates, which will compress the breast tissue, and an image will be taken. The breast will be repositioned, compressed, and imaged again. The technologist will then repeat the same sequence on the other breast. The compression can be uncomfortable, but is well-tolerated by most women. The entire exam takes less than 7 minutes. Your mammogram images will be reviewed by one of our experienced radiologists and a final report will be sent to your referring physician. Sometimes, a radiologist wants to get a better look at a particular area of breast tissue. In that case, the patient would be called back for a diagnostic mammogram, which helps the radiologist to view a specific area of the breast in greater detail than the screening mammogram images provide. A mammogram callback doesn’t mean you have cancer—in fact, almost 90% of mammogram callbacks turn out to be nothing or benign (non-cancerous) findings—but it is important to receive the follow up exam so you can receive any care that is needed. 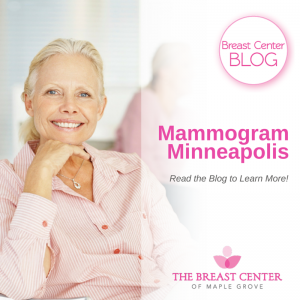 The Breast Center at Maple Grove offers the most convenient mammogram in Minneapolis. Advance and same-day appointments are available Monday through Friday from 7:30am to 5:00pm with extended hours until 8:00pm on Tuesdays. When life gets too busy to make an appointment, walk-ins are always welcome. It’s easy to get your mammogram at The Breast Center of Maple Grove! Abnormal mammogram results are no cause for panic—your doctor simply wants to get a closer look at a particular area. You will be asked to schedule a follow up test, which may be a diagnostic mammogram, breast ultrasound, or breast MRI. A diagnostic mammogram is very similar to a regular screening mammogram. The exam is performed the same way, except the technician will be taking multiple images of a specific area of breast tissue. 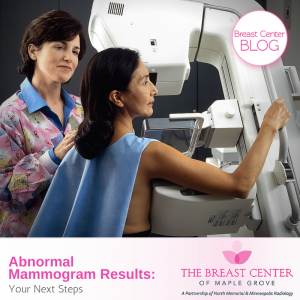 At the Breast Center of Maple Grove, same-day results are provided for patients who receive a diagnostic mammogram. Breast ultrasound is a safe and painless exam that uses high frequency sound waves and to produce real-time images of the breast tissues. During the exam, you will undress from the waist up and lie on your back or your side on the exam table. The ultrasound technologist will apply a special gel on the breast and move a small handheld device called a transducer over the breast. In rare circumstances, mammography and ultrasound may not provide enough information for a definitive diagnosis. In those cases, a breast MRI can provide an exceptional level of detail to assist the radiologist in making an accurate diagnosis. While most abnormal mammogram results turn out not to be breast cancer, it is important to schedule additional testing to ensure an early and accurate diagnosis. Additional testing most often reveals a benign (non-cancerous) finding, although it may also reveal normal tissue or breast cancer. At the Breast Center of Maple Grove, a dedicated Breast Health Patient Navigator is available to help you understand your procedures, diagnosis, next steps, and options. She is available in person, by phone or via email to answer all your questions. If it has been more than 1 year since your last mammogram, you are overdue for your annual mammogram. Come to the Breast Center of Maple Grove for convenient hours and a compassionate team of experts. For screening mammogram patients, same day appointments are available and walk-ins are welcome. Breast ultrasound uses high frequency sound waves and specialized software to produce real-time images of the breast tissues. Ultrasound does not expose the patient to radiation and is considered one of the safest types of medical imaging with no known adverse effects. Breast ultrasound is usually used as a diagnostic test to evaluate a specific area of the breast. If you’ve recently had a mammogram, your physician may refer you for an ultrasound to evaluate a particular area more closely. Ultrasound can help doctors to distinguish between a fluid-filled cyst and a solid mass. 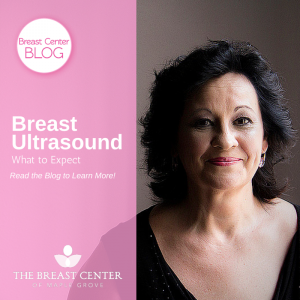 A breast ultrasound may also be performed as a secondary screening exam for women with very dense breast tissue. You will be asked to undress and remove any jewelry from the waist up. You will be given a gown to wear. You will lie on your back or side on the exam table. The ultrasound technologist will apply a special gel to your breast. A small handheld device called a transducer is placed over the gel onto the breast. The transducer sends out sound waves that travel through the body, bounce off the structures in the breast, and return to the transducer. An advanced software program processes this information and creates real-time images of the inside of the breast. The entire exam usually lasts about 30 minutes. You may resume normal activities right away. After your breast ultrasound scan, the radiologist will review your images and talk with you about your results. An finalized report will be sent to your referring physician within a few days. If you have a referral for a breast ultrasound, choose the Breast Center of Maple Grove. Our caring team provides expert ultrasound interpretations in a relaxing and comfortable environment. Call 763-398-6370 to learn more or schedule your appointment. About 1 in 8 women will develop invasive breast cancer over the course of her lifetime. Although breast cancer rates in the U.S. are actually decreasing, breast cancer is still the second leading cause of cancer death among women—second only to lung cancer. Knowing your risk and getting your regular screening mammogram are the best ways to catch breast cancer in the earliest and most treatable stage. Although breast cancer affects men and women, less than 1% of all new breast cancer cases happen in men. Women are significantly more likely to get breast cancer than men. The risk of breast cancer increases with age. While breast cancer can happen earlier, it is most common in women over age 55. According to the American Cancer society, approximately 1 out of 8 invasive breast cancers develop in women younger than 45. Approximately 2 out of every 3 invasive breast cancer are found in women 55 or older. 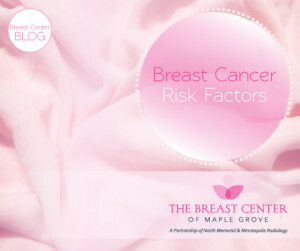 Having a family history of breast cancer increases your risk. If a close relative, like a parent, sibling or child, was diagnosed with breast or ovarian cancer, you have a higher risk of being diagnosed with breast cancer in the future. Beginning menstruation before the age of 12 or beginning menopause after age 55 can increase your risk for breast cancer. In addition, having your first child at an older age or never giving birth at all can increase your risk. Treating menopause symptoms with hormone therapy medications that include estrogen and progesterone, also called hormone replacement therapy, puts you at increased risk for breast cancer. Annual screening mammograms are recommended for all women beginning at age 40. At The Breast Center of Maple Grove, we make it easy for you to fit your mammogram into your busy schedule by offering same day appointments Monday through Friday 7:30am-5:00pm, extended hours from 7am-8pm Monday-Wednesday and we can accommodate walk-ins. If you’re due for your mammogram, make an appointment or walk right into our center conveniently located across from Maple Grove Hospital.